With hot summers and cold winters, growing and maintaining strong grass is an extremely tough job in the state of Missouri, not only for homeowners but for superintendents of golf courses and other athletic fields, too. That’s where the turf pathology group in the Division of Plant Sciences comes into play. 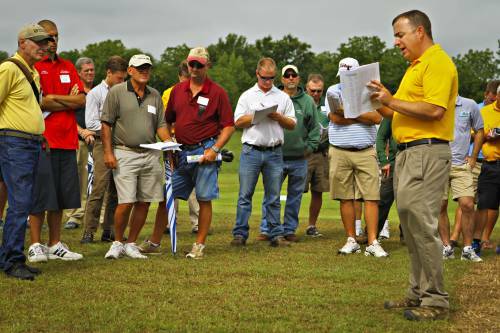 A variety of turfgrass research and projects take place at the South Farm Research Center though the group’s efforts. With hot summers and cold winters, growing and maintaining strong grass is an extremely tough job in the state of Missouri, not only for homeowners but for superintendents of golf courses and other athletic fields, too. Lee Miller’s program works with a number of grasses at the South Farm Research Center, including … Expand ▸Lee Miller’s program works with a number of grasses at the South Farm Research Center, including bentgrass and bermudagrass, which are important for golf, soccer, football and other athletic fields. They also evaluate tall fescue, Kentucky bluegrass and zoysiagrass, which are often used in home lawns and commercial areas. That’s where the turf pathology group in the Division of Plant Sciences comes into play. 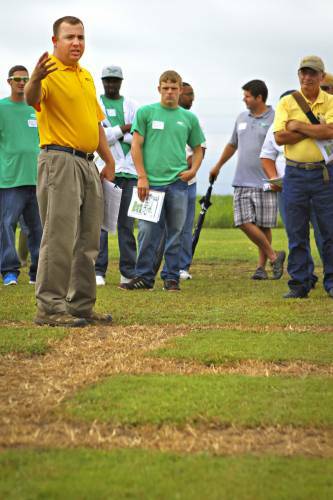 A variety of turfgrass research and projects take place at the South Farm Research Center though the group’s efforts. The turfgrass group works in the field conducting applied research, meaning they measure what works and what doesn’t. They test products that may control disease while reducing pesticide and fertilizer inputs. They also evaluate new turfgrass cultivars and species to observe what might work better in Missouri’s harsh environment, and keep close watch on other emerging trends in the turfgrass world that may be implemented here. Miller’s program works with a number of grasses at the South Farm Research Center, including bentgrass and bermudagrass, which are important for golf, soccer, football and other athletic fields. They also evaluate tall fescue, Kentucky bluegrass and zoysiagrass, which are often used in home lawns and commercial areas. 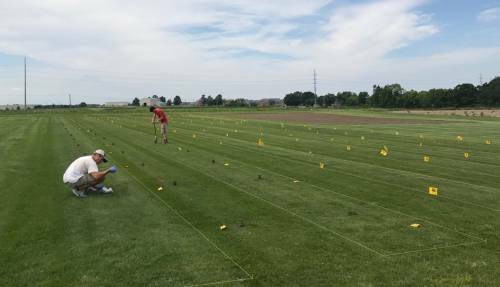 Much of the work is in cooperation with the National Turfgrass Evaluation Program (NTEP), a national program that partners university research with turf breeders to evaluate new germplasm. Within the program, MU evaluates nearly 300 varieties of 14 turfgrass species. “We’re evaluating these new cultivars and looking at possible species for use here,” Miller said. The group also conducts approximately 200 to 400 treatments for control of 10 diseases each year. Miller spends much of his time on Missouri golf courses every year in Kansas City, St. Louis and Springfield. In some cases, the program conducts on-site testing in cooperation with golf superintendents aiming for a better disease control solution. In others, Miller travels to courses experiencing problems that need diagnosis. Bentgrass is the most common grass for putting greens in Missouri. While suited to low mowing, bentgrass is extremely disease susceptible, with one of the biggest threats being dollar spot. Caused by a fungus, dollar spot is named for its size – it is similar in size to a silver dollar – and its economic impact. Worldwide, dollar spot requires many fungicide applications and much money to control it. Miller works closely with homeowners and lawncare companies as well. Individuals can send plant … Expand ▸Miller works closely with homeowners and lawncare companies as well. Individuals can send plant samples in to have them tested for a variety of problems. Without knowing what the problem is, a control strategy can be an expensive shot in the dark. Interested individuals can visit plantclinic.missouri.edu to gather more information. Zoysiagrass is another common grass on golf courses, especially on fairways, and on some home lawns. The biggest disease that threatens zoysiagrass is large patch, along with insect issues such as billbugs and chinch bugs. Large patch is farther down in the turfgrass canopy, making it a tougher pathogen to battle. Timing is incredibly important when it comes to the disease. Nitrogen fertilization during the active infection period in spring was thought to increase large patch severity. Miller’s research in cooperation with Kansas State University dispelled that notion, finding that in some cases nitrogen applications even reduced the disease. A final key grass for athletic fields is bermudagrass. While Mizzou is home to artificial turf playing fields, all of its practice fields are bermuda. Spring dead spot is a troublesome disease that infects roots and most affects bermudagrass in the region. Pesticide management is a key focus for the group as well. They assess how disease and other pests work in each grass type – and how to battle them. The goal of this work is to not only help the grass survive and thrive, but to curtail the amount of pesticides used to control disease and reduce the environmental ramifications. The turfgrass group works in the field conducting applied research, meaning they measure what works … Expand ▸The turfgrass group works in the field conducting applied research, meaning they measure what works and what doesn’t. They test products that may control disease while reducing pesticide and fertilizer inputs. They also evaluate new turfgrass cultivars and species to observe what might work better in Missouri’s harsh environment, and keep close watch on other emerging trends in the turfgrass world that may be implemented here. “If four to seven applications are necessary to control a disease, we’re trying to knock that back to only one or two,” Miller said. “A lot of it is about application timing and having a strategy in place. Miller works closely with homeowners and lawncare companies as well. Individuals can send plant samples in to have them tested for a variety of problems. Without knowing what the problem is, a control strategy can be an expensive shot in the dark. Interested individuals can visit plantclinic.missouri.edu to gather more information. “We’re kind of like Sherlock Holmes – we dig in and try to find the problem,” Miller said. “The more information we get, the better we can diagnose. We look for pathogen characteristics under the microscope and match them to the symptoms and environment. We may also recommend a soil fertility or nematode analysis to get the full story.